Blue Jays GM Ross Atkins spoke to approximately half of my Twitter timeline on Monday afternoon, offering his take on a wide-ranging number of issues that the Blue Jays will face this offseason and going forward. 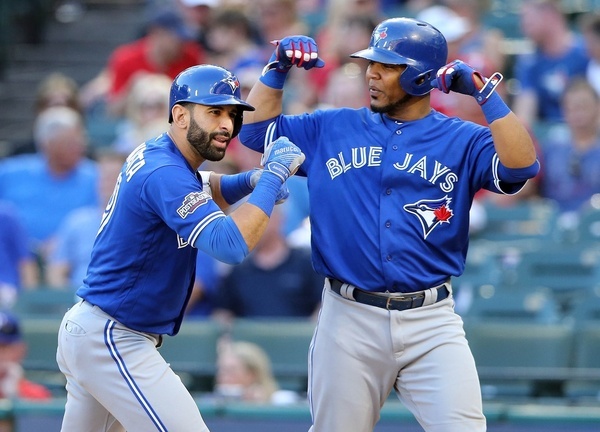 Up second: Jose Bautista and Edwin Encarnacion. It’s inevitable that the GM’s comments about impending free agents Jose Bautista and Edwin Encarnacion will generate the most talk among fans, which is unfortunate, because Atkins didn’t really say much here. Not that he should have! And not that anybody should have expected him to. But… yeah. The GM all-but-confirmed that the two would receive qualifying offers. He called the two sluggers “priorities,” said that the club hopes to use their exclusive negotiating window to try to get deals done, and didn’t tip his hand with respect to which one he’d prefer, how much they’d be willing to pay, and what the club’s payroll limitations might be. He’d have been crazy to say anything else. However, if there was any tipping of his hand, it might have been in ways that fans might get a little queasy about. Atkins mentioned wanting to add balance to a very right-hand heavy lineup and adding speed, which certainly aren’t attributes either Bautista or Encarnacion bring. That doesn’t mean it has to be one thing or the other. Could they bring back one slugger — or, if we really want to pipe dream, both — and still find ways to provide that kind of balance and speed with a couple lefty hitting corner outfielders? Absolutely. Especially if they have the kind of budget flexibility they deserve. It’s maybe a little too easy to believe that the platitudes Atkins speaks in about his potentially departing sluggers aren’t real, and the lack of sentimentality that would push him towards cheaper 1B/OF options on the free agent market and a more balanced lineup is what he really wants in his heart. We could even get especially cynical and convince ourselves to view those comments as messages to the agents of Bautista and Encarnacion that the Jays aren’t exactly going to be falling all over themselves to bring either one back, but given the interest they’ll command on the open market, that doesn’t seem like a very realistic strategy. Plus there was the talk about Bautista being an effective outfielder going forward, which… I mean… really?? It’s possible that the team with his medicals genuinely does feel that — that his play this season was hampered by the knee and toe injuries that shouldn’t impact him in the future — but unless his arm is coming back, that’s pretty hard to see. So I have no idea what that was. Whatever the case, though he was understandably coy about payroll, Atkins at least did what he could to quiet alarm bells about the club taking some kind of a step back for a season. It’s not as if he would say otherwise at this point. But he seemed to get that the idea, which is being pushed mostly by the worst kind of fear mongers with willing blindness to how valuable this team’s success is to other branches of Rogers’ media division, is not one really worth entertaining. The Jays will take another run at building a winning roster. What shape that roster will take is obviously unknown at this point, and will depend greatly on the budget and the free agent market. C’est la vie. But before we get too bummed about the idea of a Jays team going forward without Bautista and Encarnacion, let’s maybe not forget how much turnover there was between the Blue Jays of 1992 and 1993, or how vastly the face of the club changed from 1989 to ‘93. There was life after Bell and Barfield and Stieb and Key and Henke and Cone and Winfield, and it was pretty damned good. Next year’s Jays won’t need to look too much like this year’s version to be successful.